The setting is the planet Strellin where Census taker Pendle (John Savident of Fred Elliott fame) and his assistant Asta (Olivia Hallinan) are taking numbers on this Grade Three planet when they encounter Old Sixie & Mrs Clarke (Miranda Raison) who really have no business being there as no off worlders are allowed – teaming up and visiting the local monastery after the Doctor receives a psychic summons and then its all Daleks invading, mind controlled monks and a plot to use the Monks special black flower to enable the Daleks to transfer their consciousness into anyone in the Universe. Its a pretty standard story, heavy on the fruity acting, heavy on the melodrama and a healthy amount of being captured and escaping and a lot of creepy “body horror” with extra gore – all in all a bread & butter Doctor Who story and there really is nothing wrong with that. The acting treads a very fine line between farce and horror with John Savident & Colin Baker making an excellent pairing switching effortlessly between scenery chewing and deathly serious – some of the best scenes are when Old SIxie confronts the Abbot (Nick Briggs) and tries to, well you will just have to listen to find out…. The star of the show for me though is Miranda Raison as Mrs Clarke – fast becoming one of my favourite companions in any medium, she is getting a real character journey and the layers of prissy middle class woman are slowly being peeled away as we get to know her more. Its one of those stories, almost the type of story that we take for granted, traditional and very much a “Dalek” story and follows the conventions of that type. A solid 7/10. This title was released in November 2016. It will be exclusively available to buy from the BF website until December 31st 2016, and on general sale after this date. 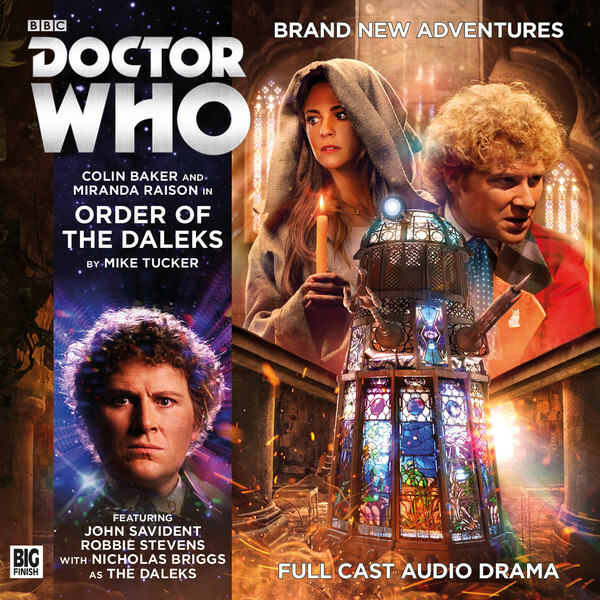 Colin Baker (The Doctor), Miranda Raison (Constance Clarke), John Savident(Pendle), Olivia Hallinan (Asta), Robbie Stevens (Boswyck/Raspak), Sam Fletcher(Rosco/Gabber), Joseph Kloska (Habrild), and Nicholas Briggs (Tanapal and The Daleks). Other parts portrayed by members of the cast.